Brain tumors are typically very heterogeneous, aggressive neoplasms at the cellular level which affects both children and adults . Statistics based on cancer research institute explore that 1 in 161 individuals born today with brain cancer at different point of life. In the U.S., 22,850 men and women are diagnosed with brain cancer every year, and 15,320 deaths are caused by this disease . As per World health organization classification, glioblastoma (GBM) is also known as grade IV astrocytoma . GBM is one of the most malignant form of human brain tumor. The mean survival time for GBM patients is approximately 12 months . Time-lapse video microscopy is a technique that aids to assess cellular behavior in real time. This technique is used to collect a two dimensional image data at different time intervals. Then, these data are converted to make a movie. This unique technique is used in various fields of cancer and stem cell biology for assessment of cell translation, division, and death [5,6]. Presently, several strategies are available for the treatment of GBM such as surgical techniques, radiotherapy, chemotherapy and electrochemotherapy . Apart from commonly used chemotherapeutic agents (such as nitrosoureas derivatives, platinum based drugs, and taxol) and gene therapy, as a novel therapeutic modality frequently being used in cancer . However, chemotherapy suffers several major drawbacks such as all tumors are not responsive to chemotherapeutic agents to some extent, incidence of bone marrow cells damage, amenorrhea, alopecia, sexual dysfunction and adversely affect the quality of life of patients . Malignant brain tumors like GBM are very difficult to treat now a days. The difficulties to treat against GBM are due to lack of proper preventive strategies, and unavailability of practical method for screening . Therefore, new, more effective and better tolerated anti-tumor drugs or some alternative treatment strategy are needed. Based on the above lacunas an alternative way which may be useful to kill or eradicates the proliferative tumorous cells and simultaneously defense the normal brain glial cells. Biofield treatment is an alternative approach which may be useful to improve these unfilled spaces associated with cancer patients. The human biofield is the energetic matrix that surrounds the human . It directly links with the cellular activity that allows the DNA to communicate faster than light and maintain intelligence in the organisms . According to universal principles of Maxwell’s equations and principle of reciprocity defines electromagnetic connections related to human biofield . Thus, a human has ability to harness the energy from environment/Universe and can transmit into any object (living or non-living) around the Globe. The object(s) always receive the energy and responded into useful way that is called biofield energy. This process is known as biofield treatment. The biofield can be monitored using electromyography, electrocardiography and electroencephalogram . Mr. Mahendra Trivedi’s unique biofield treatment (The Trivedi Effect) has been well known for altered characteristics features of microbes [15-17], improved the overall productivity of crops [18,19], and also transform the structural, physical and chemical properties of materials [20-23]. Exposure to biofield energy caused an increase in medicinal property, growth, and anatomical characteristics of ashwagandha . On the basis of above facts and literature, present study was undertaken to evaluate the impact of Mr. Trivedi’s biofield treatment on human GBM brain tumor cells. Human U87 glioblastoma cells were received from California pacific medical center research institute, bioscience laboratory, San Francisco, CA. The cultures were prepared and maintained as per the protocols. The GBM cultured cells were divided into two groups viz. GBM control and GBM treatment. Besides this, normal brain cultured cells were also divided into two groups such as non-GBM control and non-GBM treatment. Prior to experiment, each cell culture plate was prepared with six replicates (n=6) of both GBM and non-GBM cells. Each cell culture plate was grown side-by-side in sub-compartments of one culture plate, so that both types of cells were exposed to treatment and without treatment simultaneously. One set of culture plates (GBM and non-GBM treatment) were handed over to Mr. Trivedi for biofield treatment under laboratory condition. Mr. Trivedi provided the treatment through his energy transmission process to the culture plates in front of the time-lapse microscope to deliver biofield treatment from outside a plexiglass environmental chamber attached to the microscope without touching them. Another set was considered as control experiment in which no treatment was delivered. After treatment, all the culture plates were analyzed for assessment of biofield treatment potential. 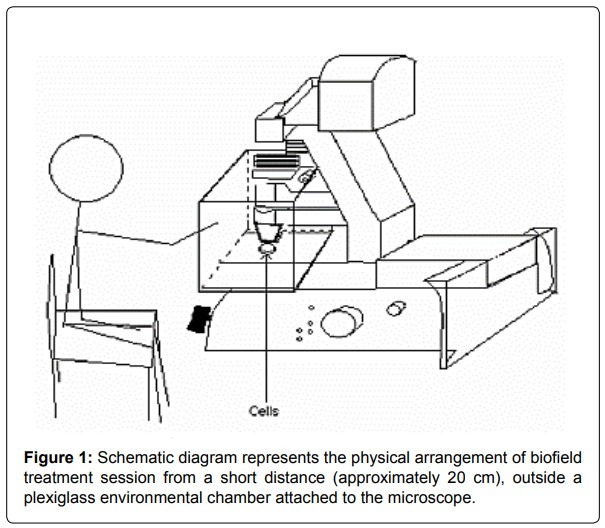 In brief, during the experiment involving biofield treatment, Mr. Trivedi was escorted to the laboratory and seated a short distance (approximately 20 cm) from the time-lapse microscope (Figure 1). During the control experiment, the cells were handled identically but Mr. Trivedi did not visit the laboratory. A laboratory technician placed the cell culture plates inside of an environmental chamber for examination by time-lapse microscopy without knowledge of the eventual treatment condition for the samples. The following day, laboratory technician has converted the acquired images into Quicktime movies and transferred the movies to a database using blinding codes for analysis. Two time-lapse video microscopy experiments were followed in human brain tumor GBM cells and normal brain cells for 20 hours time cycle. Microscopic images were acquired in every 5 minutes interval, from 10 hours prior and 10 hours following the treatment time i.e. 20 hours for each experiment, and compiled into time lapse videos. Figure 2 depicts the time schedule for two time-lapse video microscopy of cell cultures . the microscopic field after the initial frame were neither included, nor identified as dead at the start of the video. Cell death, divisions and emigrations (cells migrating out of the microscopic field) were counted for varying numbers of cells and count was made every single hour. After that, all the data were collected and entered into excel spreadsheets, the blinding codes were revealed and the results were sorted according to experimental group for analysis. Since, brain tumors especially GBM are the most critical medical problem affecting major part of population, physician suggests chemoprevention along with radiation strategies to reduce the incidence and mortality rate. However, there are scientific evidence and large number of in vitro studies already reported for biofield treatment and its effect in cancer cells [26,27]. Previous studies indicated that biofield energy showed an inhibitory effect on metastasis and immune responses in cancer cell models [11,26,28]. Where, N(t-1) is the number of cells at the start of the time period and d(t) is the number of deaths during the time period. These estimates are based on an assumption that counts are dependent on the number of cells present . The potential impact of biofield treatment on GBM brain culture cells was assessed by comparing cell death rates before and after treatment. In non-GBM (control) group, values for cell division were not significantly analyzed due to very low cell divisions rate, as the majority of the cell counts being zero throughout the 20 hours observation period. This lack of cell division under control conditions for the normal brain cells indicated that the culture conditions were not sufficient to keep the normal cells viable throughout the extended time in culture. This is often may be the case with cultures of normal cells, whereas cancerous cells typically survive in culture more readily. Comparing the total number of cell deaths over the 10 hours prior and 10 hours following the treatment time (T = 0) for the four groups of cells and dividing these values by the initial cell counts for each group gives a rough estimation of the potential effect of treatment. Analysis using the exponential growth model indicates that the cell death rate in GBM treatment cultured cells increased after biofield treatment however, no change in cell death rate was observed in GBM control cultured cells. 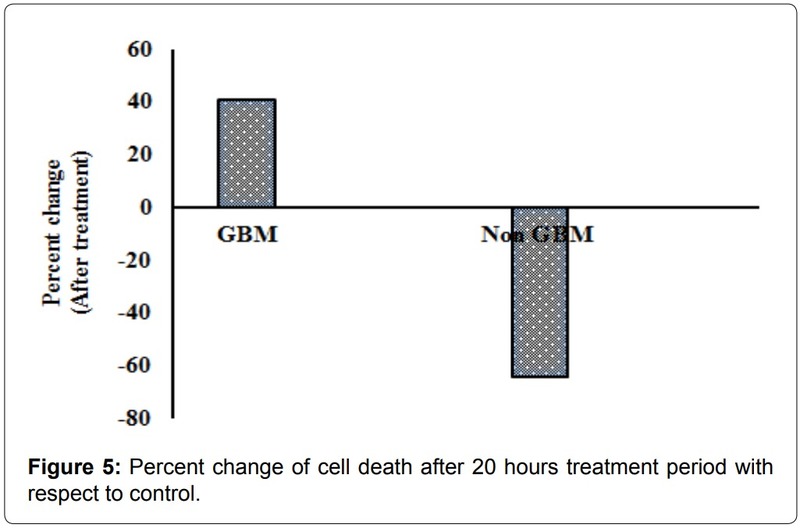 Moreover, the non-GBM treatment cultured cells has appeared to be protected from a baseline increase in cell death rate observed in the untreated non-GBM control cultured cells (Figure 3). The increase in cell death rate as observed in the untreated non-GBM control cultured cells was consistent while the cancer cell viability was more robust . Pre-treatment values were subtracted from post-treatment values to evaluate the relative change in cell death rate after treatment time (T = 0) and referred as delta (δ). 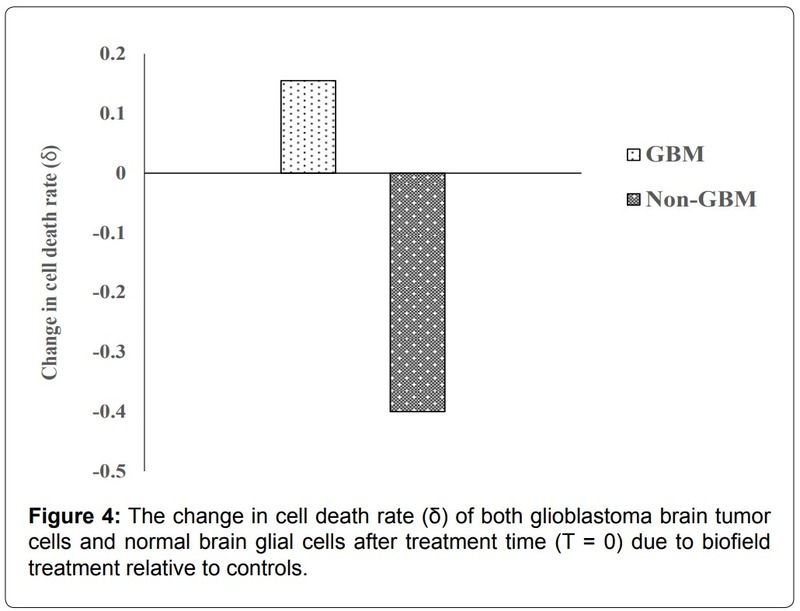 The δ values (as measured from before to after treatment per initial cell) due to biofield treatment relative to controls for GBM cells and non-GBM cells are shown in Figure 4. The advantage of biofield treatment is that they are inexpensive as compared to other types of cancer therapies. According to a recent report regarding biofield treatment later on, it was approved by the German equivalent of the FDA. It was emphasized that cancer patients have experienced healing with biofield treatment. Nowadays, many scientists and cutting edge practitioners believed that the secrets of regeneration and healing lie not only on costly medical drugs or expensive medical treatments, but also in the body’s own Quantum Energy Biofield (QEB) . very popular and scientifically studied [31,32]. Therefore, Mr. Trivedi’s biofield treatment could be an effective (with no existing side effects), cost effective (no drugs were used) and alternate approach for cancer chemotherapy. Research on biofield treatment and its impact on cancer growth has been continuously studied by researchers, which might works as alternate and complementary medicine to prolong the life of cancerous patients along with quality life. Overall, the study data indicates that biofield treatment has significantly increased (41%) the death rate of GBM brain tumor cells as compared to untreated GBM cells. 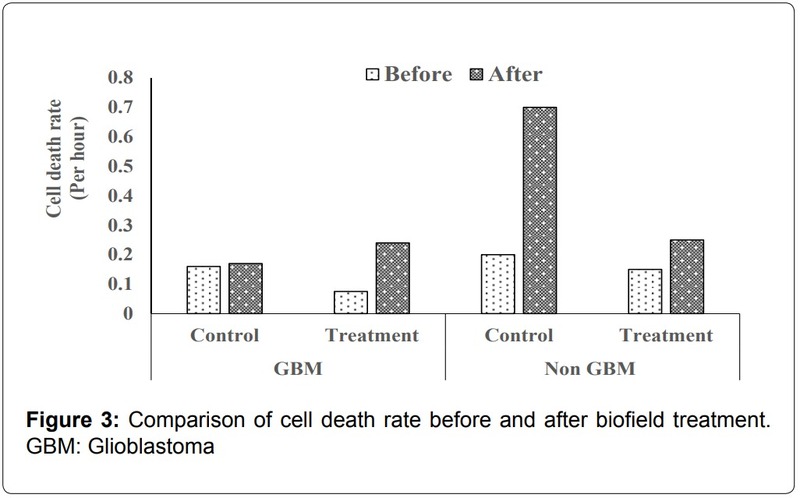 Besides this, non-GBM treatment cultured cells showed a significant reduction of cell death rate (64%) as compared to normal brain cells (Figure 5). Based on the obtained results, it is expected that biofield treatment could be novel, cost effective and an alternative advanced strategy towards brain tumor patients. In conclusion, the study results suggest that the biofield treatment has significantly increased (41%) the cell death rate of GBM treatment brain tumor cells, as compared to GBM control cells. In addition, biofield treatment also showed a significant reduction of cell death rate (64%) in non-GBM treated culture cells i.e. protective effect as compared to non-GBM brain cells. Based on the results, the inexpensive biofield treatment approach could be used in glioblastoma brain tumor patients in near future to improve the quality of life. Trivedi science, Trivedi testimonials and Trivedi master wellness gratefully acknowledged to the whole team of the bioscience laboratories, 665, Third Street, San Francisco, CA for their support. 1. Dirks PB (2010) Brain tumor stem cells: the cancer stem cell hypothesis writ large. Mol Oncol 4: 420-430. 3. Louis DN, Ohgaki H, Wiestler OD, Cavenee WK, Burger PC, et al. (2007) The 2007 WHO classification of tumours of the central nervous system. Acta Neuropathol 114: 97-109. 4. Hide T, Kuratsu J (2009) [Progress in the study of brain tumor stem cells as treatment targets]. Brain Nerve 61: 781-789. 5. Patel S, Pine S, Rameshwar P (2013) Time-Lapse video microscopy for assessment of self-renewal and division kinetics. Protocol Exchange. 6. Taft R, Moore D, Yount G (2005) Time-lapse analysis of potential cellular responsiveness to Johrei, a Japanese healing technique. BMC Complement Altern Med 5: 2. 7. Sersa G, Cemazar M, Rudolf Z (2003) Electrochemotherapy: Advantages and drawbacks in treatment of cancer patients. Cancer Therapy 1: 133-142. 8. Castro MG, Cowen R, Williamson IK, David A, Jimenez-Dalmaroni MJ, et al. (2003) Current and future strategies for the treatment of malignant brain tumors. Pharmacol Ther 98: 71-108. 9. Hall E, Cameron D, Waters R, Barrett-Lee P, Ellis P, et al. (2014) Comparison of patient reported quality of life and impact of treatment side effects experienced with a taxane-containing regimen and standard anthracycline based chemotherapy for early breast cancer: 6 year results from the UK TACT trial (CRUK/01/001). Eur J Cancer 50: 2375-2389. 10. Wen PY, Kesari S (2008) Malignant gliomas in adults. N Engl J Med 359: 492-507. 11. Running A (2015) Decreased Cortisol and Pain in Breast Cancer: Biofield Therapy Potential. Evid Based Complement Alternat Med 2015: 870640. 12. McTaggart L (2003) The Field. New York, Harper Perennial. 13. Maxwell J (1865) A dynamical theory of the electromagnetic field. Phil Trans R Soc (Lond.) 155: 459-512. 14. Movaffaghi Z, Farsi M (2009) Biofield therapies: biophysical basis and biological regulations? Complement Ther Clin Pract 15: 35-37. 16. Trivedi MK, Patil S (2008) Impact of an external energy on Yersinia enterocolitica [ATCC-23715] in relation to antibiotic susceptibility and biochemical reactions: an experimental study. Internet J Alternat Med 6. 19. Sances F, Flora E, Patil S, Spence A, Shinde V (2013) Impact of biofield treatment on ginseng and organic blueberry yield. Agrivita J Agric Sci 35: 22-29. 20. Trivedi MK, Patil S, Tallapragada RM (2013) Effect of biofield treatment on the physical and thermal characteristics of silicon, tin and lead powders. J Material Sci Eng 2: 125. 21. Trivedi MK, Patil S, Tallapragada RM (2013) Effect of biofield treatment on the physical and thermal characteristics of vanadium pentoxide powder. J Material Sci Eng S11: 001. 22. Trivedi MK, Patil S, Tallapragada RM (2014) Atomic, crystalline and powder characteristics of treated zirconia and silica powders. J Material Sci Eng 3: 144. 23. Trivedi MK, Patil S, Tallapragada RM (2015) Effect of biofield treatment on the physical and thermal characteristics of aluminium powders. Ind Eng Manage 4: 151. 24. Altekar N, Nayak G (2015) Effect of biofield treatment on plant growth and adaptation. J Environ Health Sci 1: 1-9. 25. Muzzey D, van Oudenaarden A (2009) Quantitative time-lapse fluorescence microscopy in single cells. Annu Rev Cell Dev Biol 25: 301-327. 26. Yount G, Patil S, Dave U, Alves-dos-Santos L, Gon K, et al. (2013) Evaluation of biofield treatment dose and distance in a model of cancer cell death. J Altern Complement Med 19: 124-127. 27. Chen KW (2008) Inhibitory effects of bio-energy therapies on cancer growth. World Sci Tech Modern Trad Chin Med 10: 144-152. 28. Gronowicz GA, Jhaveri A, Clarke LW, Aronow MS, Smith TH (2008) Therapeutic touch stimulates the proliferation of human cells in culture. J Altern Complement Med 14: 233-239. 29. McAllister SD, Chan C, Taft RJ, Luu T, Abood ME, et al. (2005) Cannabinoids selectively inhibit proliferation and induce death of cultured human glioblastoma multiforme cells. J Neurooncol 74: 31-40. 30. Marshall RJ The best kept secret in nutrition: The body’s biofield communication system. Premier research labs. Austin, USA. 31. Shen MX (1997) Qigong is an effective way to defeat cancer. China Qigong Science 5: 8-10. 32. Chen K, Yeung R (2002) Exploratory studies of Qigong therapy for cancer in China. Integr Cancer Ther 1: 345-370.